Watch the video to hear What Writers Say About Rosanne's Presentations. It was great to work with Rosanne. She provided information about the event in a timely manner. Attendees found her unique take on writer’s block and the tools and techniques she provided very helpful. I would definitely recommend her as a speaker and hope to have her at future events. Thanks for your wonderful presentation for TC writers. It was truly inspiring and educational. We hope to see you again. You were terrific! Rosanne’s presentation style is warm, witty and engaging. She combines this with a willingness to share her knowledge and wisdom. Everyone can find something of interest in her programs whether they are interested in exploring their inner creativity or want to write a book. Regardless of your focus, Rosanne’s program is one you won’t want to miss. Regina Barr, CEO, Red Ladder, Inc.
Incredibly powerful presentation. I thank you and my husband thanks you for the insights I gained. Thank you so very much for sharing your day and knowledge with us. Your concepts and creativity are truly what the world needs for today's business climate. Thank you for the great job you did presenting at our seminar. The way you tailored your presentations to our seminar's Monopoly theme helped tie everything together for a great day. I particularly liked your insights into the brain. I could certainly see how recent stressors have hampered my creativity. Your seminar motivated me to find time to relax and create my own writer’s ritual. Fascinating! Rosanne’s passion is contagious. The most valuable tool I got from Rosanne’s presentation was learning about the ‘plastic’ brain. Rosanne is very motivational, intelligent and engaging! Once you understand the process and physiology of resistance, you are better equipped to handle resistance in your life. Rosanne was well versed and passionate about the subject. Very helpful! Gives insight into my – and others'– responses to change. Knowing that physiology plays a big part in my resistance really takes the guilt out of the mix. Rosanne is very interesting, knowledgeable, confident and open. Rosanne’s ability to integrate information from a number of realms and make it practical is tremendous. Great info on our brains and how we can change them. I had no idea how many forms resistance takes. This was fantastic and so timely. Rosanne is clear, concise and on topic. Great content for one hour – jam packed in fact. 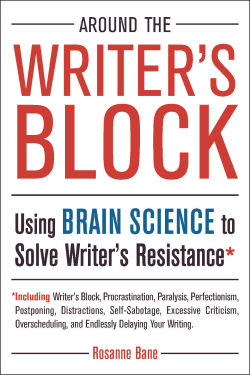 Rosanne Bane offered solid advice on tools and techniques to overcome writer block. Rosanne’s Writing Resistance presentation was really new and different. 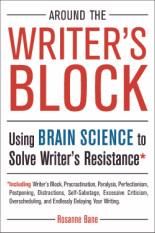 Writing Resistance presentation was most helpful to me because of where I was as a writer. Rosanne has a wealth of information that she presents in an interesting and entertaining manner. Inspiring! Terrific! Phantasmagoric! Lucid! Thanks! Amazing amount of information. Excellent handout and exercises. Excellent presentation. Really made me think about what a human being can do. Fascinating tools and terms to explain and explore my own experience. And plenty of materials for follow up. Very insightful and humorous. Rosanne is so fun! She opened up new insights. Rosanne knew how to engage us by changing the presentation mode throughout. I knew I had a mental ‘junk drawer’ but the motivation to investigate it was lacking until I heard Rosanne Bane. Wow! Rosanne gave me a lot to think about. She's a wonderful speaker. Good information, well presented. Rosanne honored a variety of learning styles. I like how you use research and science. It's fascinating and helpful. I made connections I didn't expect. This tool (polarity management) is so valuable and universal. It will fit in many parts of my life. Rosanne is open to the needs of each participant. I'm inspired! The whole theory of the Saboteur is powerful. I learned what my Saboteur is and what it says. I don't like confronting my Saboteur, but I know why I need to and how to do it. Rosanne is playful and welcomed others to be the same. Her direct, light-hearted approach to the material gave me hope and made it fun even while dealing with a frustrating issue. Your 1 to 5 point scale is too limiting. I have to give you a 10 on everything. Rosanne set us up for good give-and-take between the participants. Fascinating info and good practical tips for implementing the ideas. With Rosanne's fun personality, brilliance and teaching style, what's not to like? I like the variety of creative approaches and excellent invitations to expand and develop writing from our creative source. It really made me think outside my own "box" and wasn't all easy. But it got me to the next level of growth. Rosanne balances her delivery between content and process. Rosanne's style is fun, enriching, rewarding and created a strong sense of community. Great workshop, Rosanne. Thanks for sharing your expertise. I think this will be a great help for me personally and for my clients. What I liked best about the workshop was everything. This was amazing and so well done. It was such a huge gift. Thank you!